This journal was a Christmas gift from Danielle. 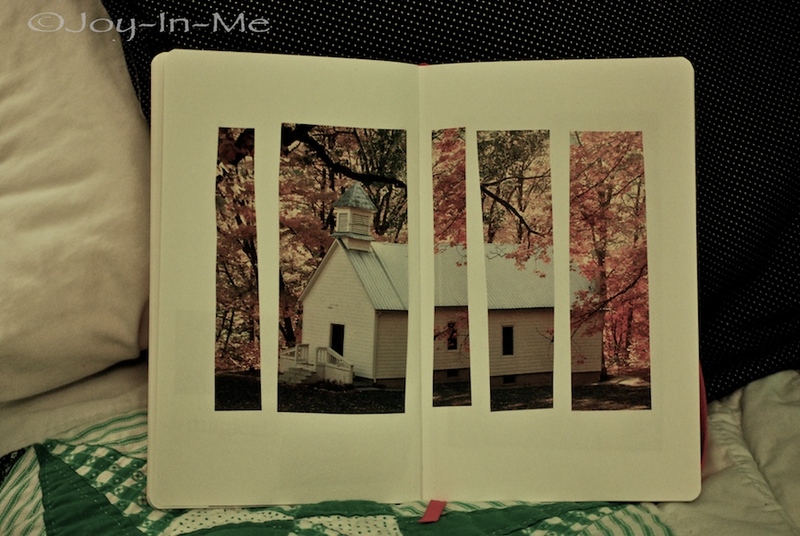 She started the journal for me by gluing magazine cut outs–pictures and words–on every few pages. I love it. I have since added my own, but I love coming across something that she added. It’s a great reminder to be thankful–for her and for those precious people in my life. They’re all pictures I would have put in there on my own–so it’s sometimes hard to remember if they are from her or my own additions. The age is getting to me. Anywho, I thought this image would be appropriate for today, Sunday. Isn’t it beautiful (excuse the awful green light in my room)? I also just finished iChatting with Danielle–which I’m SO SOOOOOOOOOOOOOOOOOO glad we can now do. Woo! The little things. Thanks be to God for iChat. It’s been really important in my life. Thankful for technology to help us keep in touch! I’m thankful for a lot of other non-technology-or-material-related-things, but at this moment I’m selfishly thankful for iChat. Call me a nerd. Whatever.I’m just glad we now have another avenue for keeping in touch!